Action Figure Insider • View topic - NEW DCUC POLL - DC Villains! 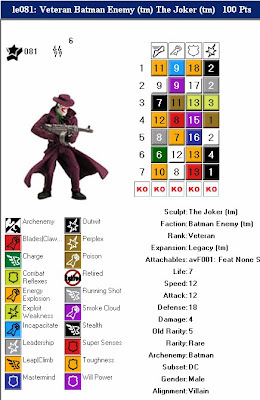 id really like to see a good joker thats in scale (the DCSH one was too small), nicely articulated, and filled with cane and card related accessories. Agreed! I'd love to see a new Joker figure. A new Joker would be cool, but my Hush version of Joker and Scarecrow fit in pretty well, so I'll be okay on that for awhile. I can't agree more, Superfly. The Joker NEEDS to get a decent figure in this line, and the hat-and-coat design is the one that never gets made. Ideally, he should have decent accessories (removable hat, cane, .38) rather than the usual flag gun, as well. I also really want to see a Ra's al Ghul, perhaps with the recent "White Ghost" incarnation as a varient? Last edited by regwec on Wed Mar 12, 2008 10:54 am, edited 1 time in total. Some of these like Joker and Black Adam just seem like sure thigs to me, so I vote for Catman! Give me Flash Rogues and I'll be happy. And some Suicide Squad characters. Seeing as Joker is just a matter of time, I want a new Bane. It would be a CnC, I'm sure, but they have to make sure and get the scale right. He should be bigger than the normal figures, but still smaller than Grundy and Grodd.